while their rooting multiplies the rejuvenation of the forest. the self-seeding of new forest. 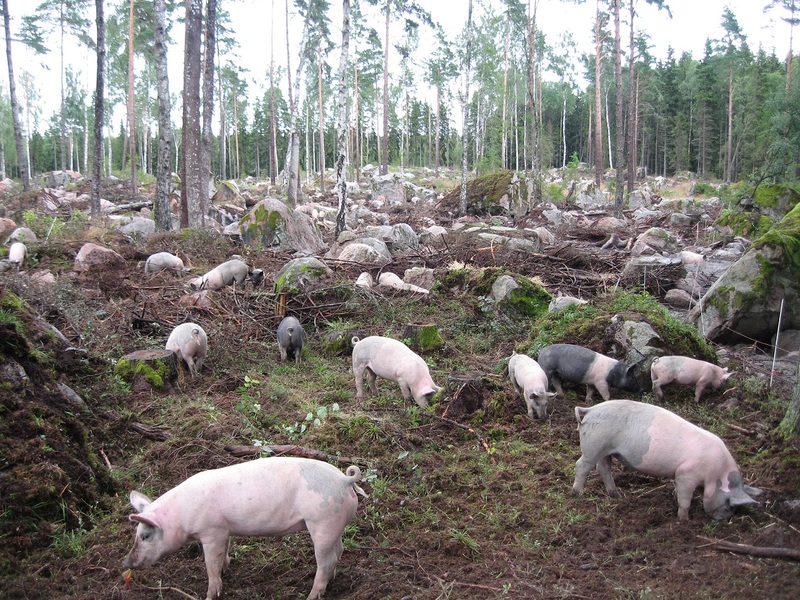 Pig-rejuvenated forest, 25 years old, where 4 out of 5 trees are thinned away. of this research-grove for agroforestry on farm. where the feed and straw are produced, simultaneously as manure can easily be spread on the feed-producing land. To reintroduce animal production to the feed producing farms/areas is a key factor for good nutrient management. good distribution of manure and protection against contamination. Straw is placed in the movable houses every day. that the snow falls early sometimes. 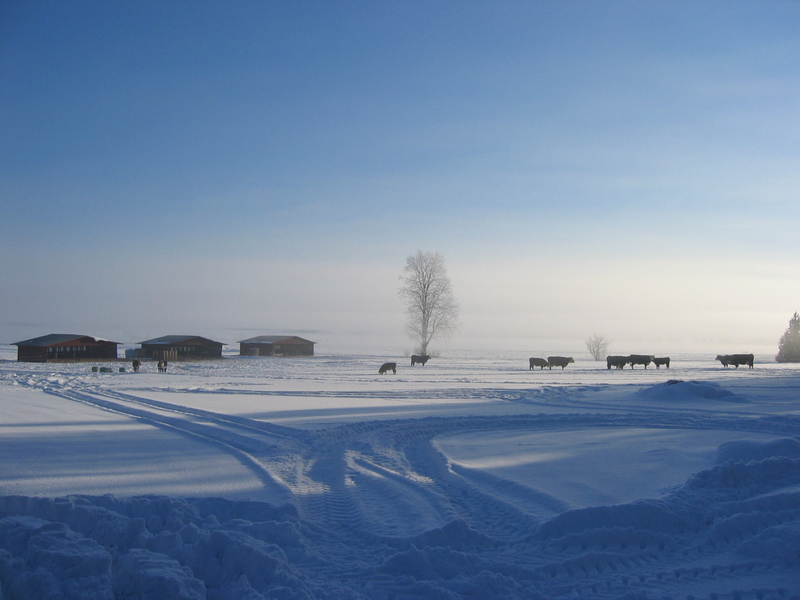 Grazing animals thrive outdoors all year long. The sheep also thrive with good paddock, and movable house. Hånsta Östergärde is a mixed organic farm located in Vattholma, 20 km north of the town Uppsala in the south east of Sweden. 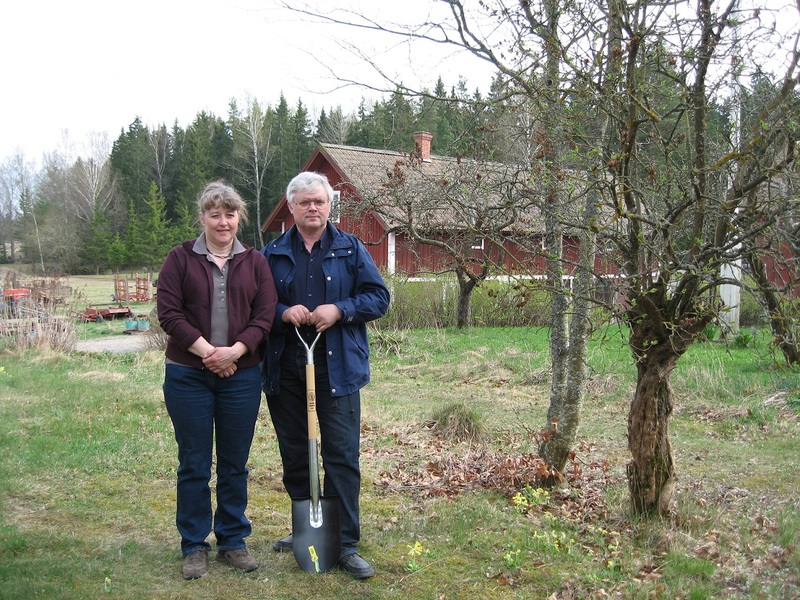 The farm is run by the farmers Ylva and Kjell Sjelin. 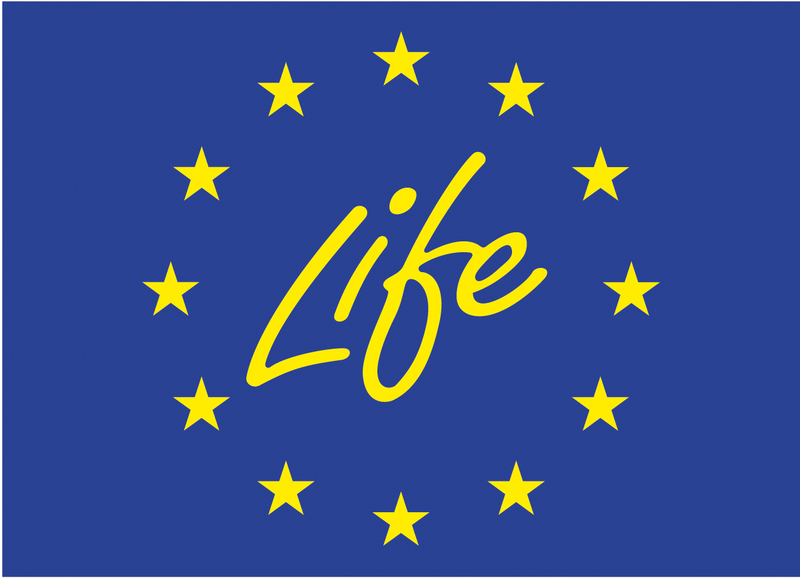 They have 170 ha of arable land, 10 ha grazing land and 100 ha of forest land. The animal production consists of 15 livestock, 30 ewes and 10 sows which are all kept outdoor throughout the whole year. 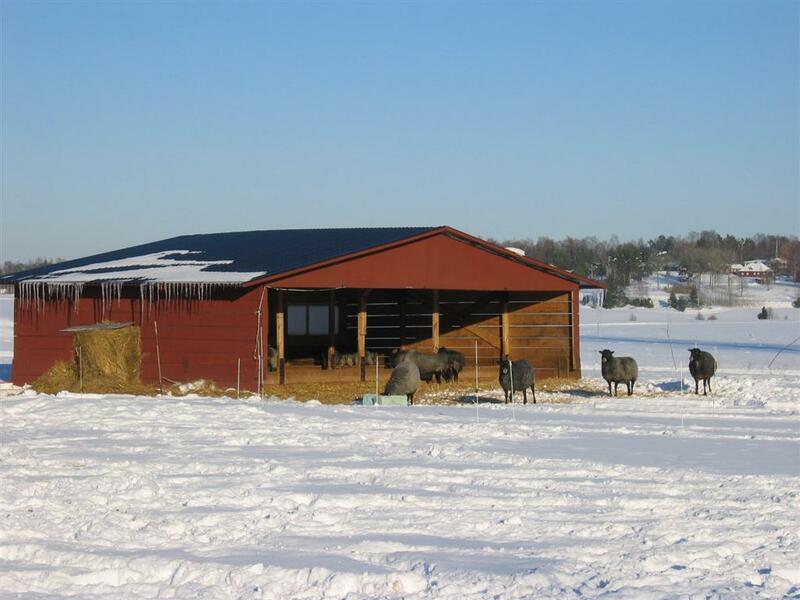 During the winter cows, pigs and sheep are kept in winter pens close to the farm center on fields with ley which is plowed the next spring. 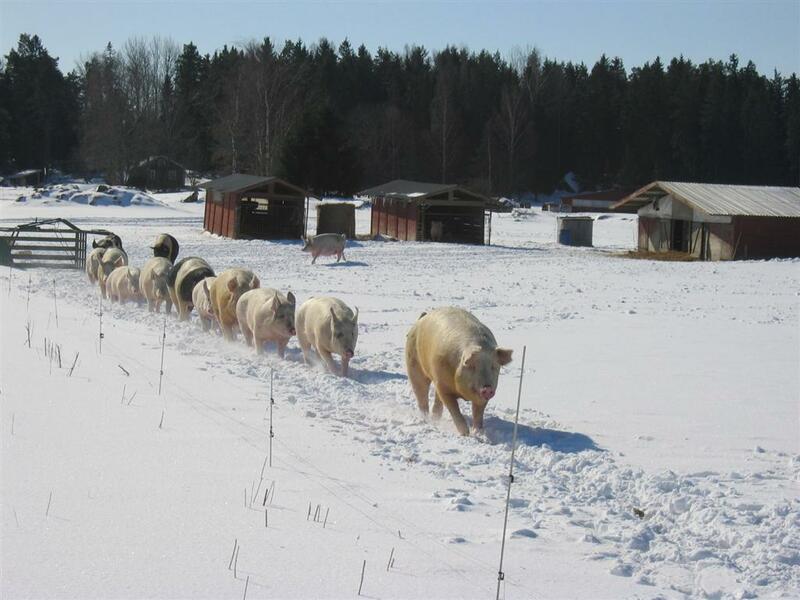 The sows give birth in spring and spend the summer with their piglets in the forest where they act as an excellent resource for soil preparation before or after harvest. 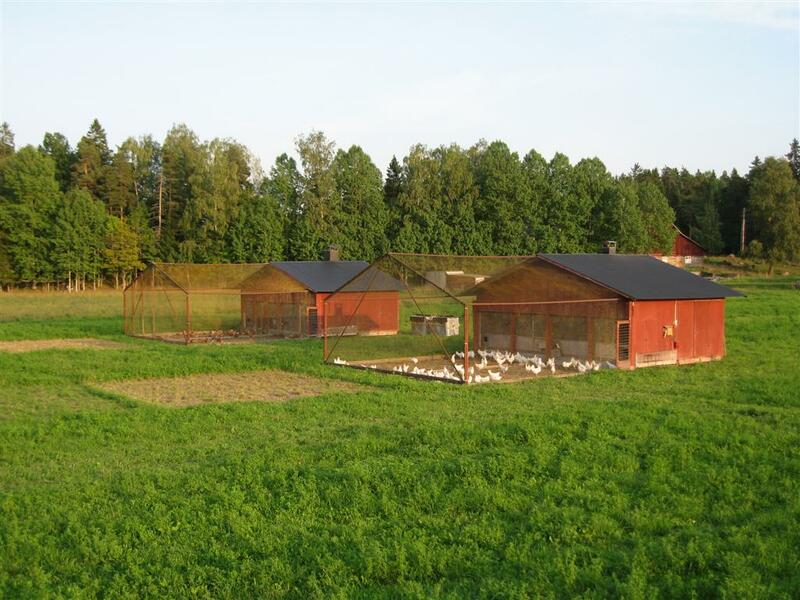 Hens are kept in movable houses which during summertime are moved over the leys, giving the hens access to fresh grazing grounds. Agricultural challenges are that we now must repair the life supporting systems such as a stable climate and beyond producing more food for more people. We want to take part in the implementation of these two tasks. All animal are kept outdoors through the whole year. During the winter cows, pigs and sheep are kept in winter pens close to the farm center on fields with ley which is ploughed the next spring. 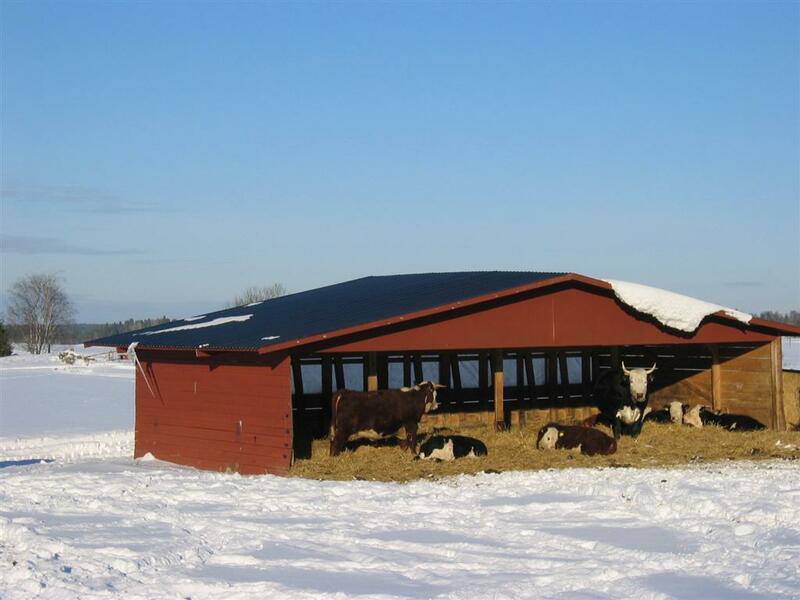 The animals have access to open sheds with straw bedding. Straw is added daily, when the height reaches 40-50 cm the shed is moved and new bedding is started. The cows calve late autumn. 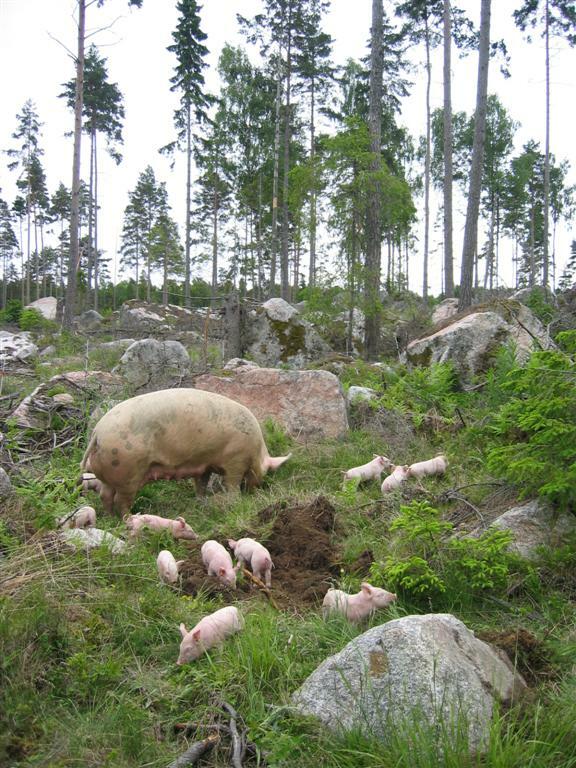 The sogs give birth in spring and spend the summer with their piglets in the forest where they help prepare the rocky ground before or after harvest through smaller clear cuttings. 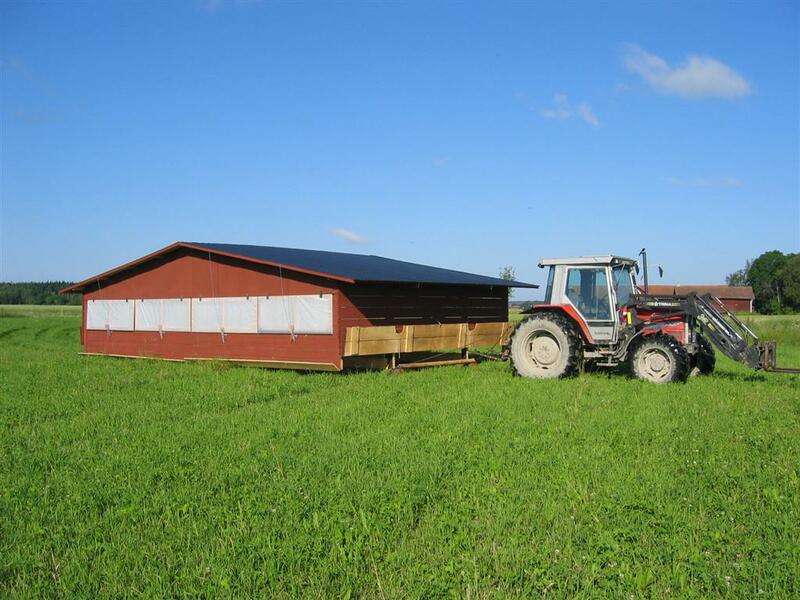 Hens are kept in movable houses which during summertime are moved over the leys giving them access to fresh grazing. Through these activities input costs and associated CO2 emissions are saved related to produce feedstuffs for the animals as well as transportation of feedstuffs and manure. Farm introduces triticale-winter pea mixed culture which improves yield stability of peas which are otherwise cropped in monoculture along with the problems of logging, weed and disease infestation. The protein yield per hectare will be increased along with a reduction of N2O emission due to integrating of N fixing crop and reduced N fertilisation. 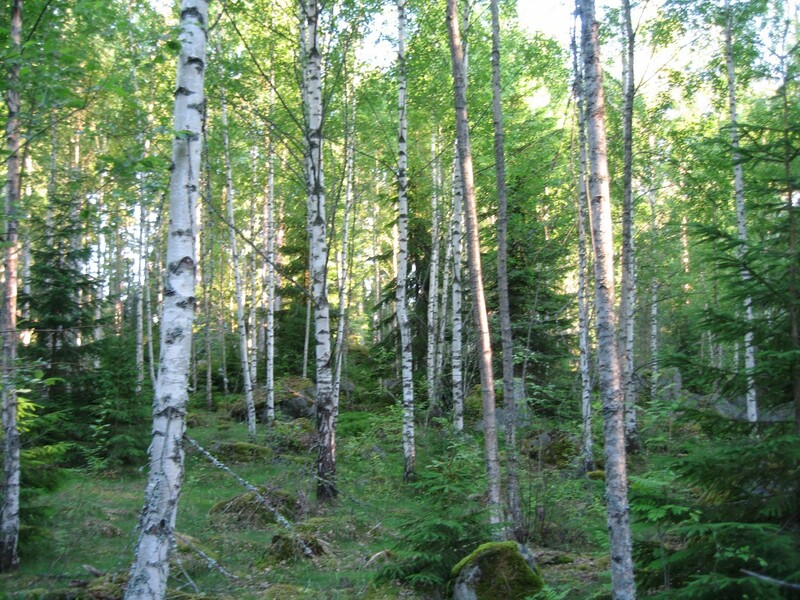 The higher aboveground biomass of this practice compared to its mono-cultural counterparts also contributes to C sequestration when incorporated into soil. Furthermore farm maintains the 28.6% proportion of forage legumes in the crop rotation (2 out of 7 years) instead of going for 1 year of cereal cropping. 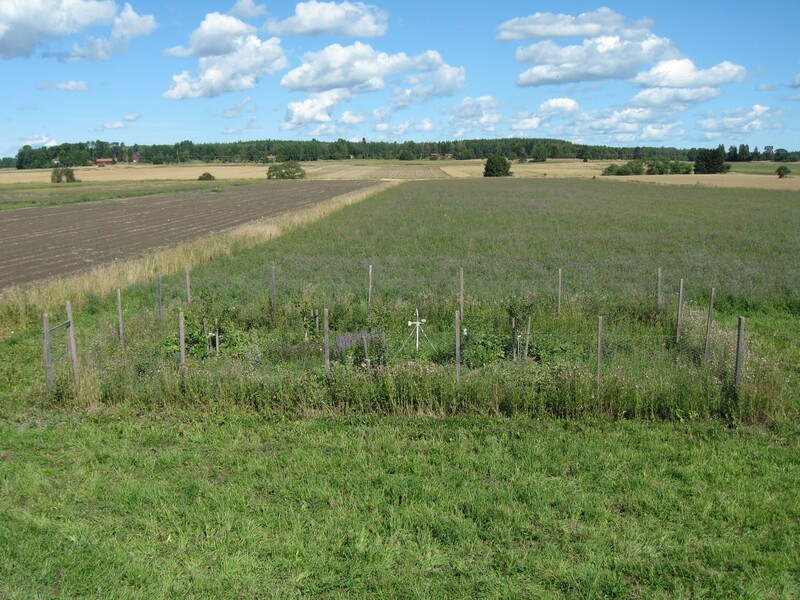 Forage legumes contribute to N fixation (reduction of N2O emission) and C sequestration. Farm reduces tillage activities by planting spring and winter cereals simultaneously in the spring. The winter cereal grows slower and stays low until the spring cereal is harvested. It is then overwintered and harvested the next year. From 2014 there will also be a growing trial on the farm with perennial wheat lines from The Land Institute in Kansas. By employing these practices diesel consumption will be reduced along with humus accumulation in soil (carbon sequestration). 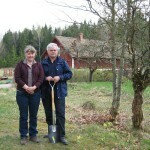 The farm installed hedgerows and tree strips which lead to C sequestration in above- and belowground biomass and in soil. Part of the woody biomass is used for heating and thus replaces fossil fuel (CO2 mitigation). New tree strips on grassland/arable land are in planning. Special credit goes to Kjell Sjelin for the photographs published in this page.